During my travels to Sri Lanka, I’ve always stayed at the historic Galle Face Hotel while in Colombo. The Galle Face Hotel is over 150 years old, a slightly weathered but elegant remnant of the British Colonial era. Situated by the Indian Ocean, it was Arthur C. Clarke‘s favorite hotel; he actually wrote most of 3001: The Final Odyssey in it’s Presidential Suite, and it was one of the few places you could get him to join you for dinner; the Galle Face’s old time elegance, cool evening ocean breezes, view of the sunset and an excellent kitchen made this very understandable. Frequently on weekends the hotel hosted weddings, always a busy time. It was common for these weddings to feature young people in traditional dress who danced and performed at the reception. 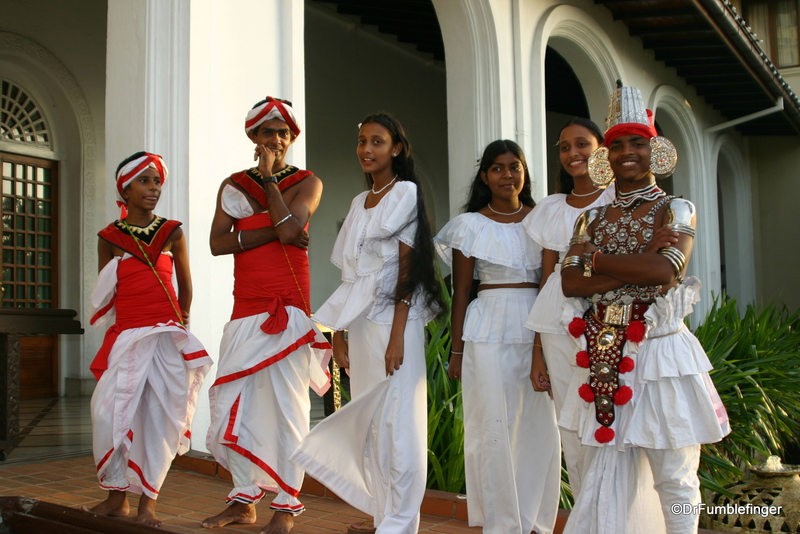 One day at dusk I was readying myself for a walk along the ocean by the Galle Green, a large park adjoining the hotel, when I encountered this group of dancers on the hotel’s veranda enjoying the refreshing evening breeze and waiting for a wedding to end and its reception to begin. I enjoy meeting and interacting with Sri Lankans who tend to be shy people, but once approached usually share a beautiful smile and polite conversation. I asked the dancers if they minded if I took their photo. Obviously they didn’t and I was rewarded with a souvenir of a beautiful group of people!